I decided it was my mission to find another site that offered equally adorable and nice-for-the-nose bath bombs, for a smaller cost. It took a while - the cheaper bath bombs that I found weren't as pretty and just didn't appeal to me. Then I stumbled upon PlanetYum. It's an Australian website, which obviously appealed to me - being an Australian and all! However, they do ship internationally, so any of you who aren't from down under and happen to fall in love with these (as I did!) can still make an order. Cute, aren't they? I don't think they're as creative looking as the lush ones, but they're still nice. I don't know if you can tell from the picture, but the Bee Nurtured bar is in the shape of a bee hive. And Parisienne has little sequin hearts in it --- not sure how appreciated they'll be while in the bath, but they look pretty all the same. As you can see, PlanetYum's bath bombs aren't all that much cheaper than Lush. The savings only work out to be $4.20 - slightly less than the price of another bomb. And like I mentioned above, I don't think Planet's bombs are as pretty. Which yes, is a factor for me even though it makes no difference once it's crumbled in the bath. I just like nice looking things, okay?! 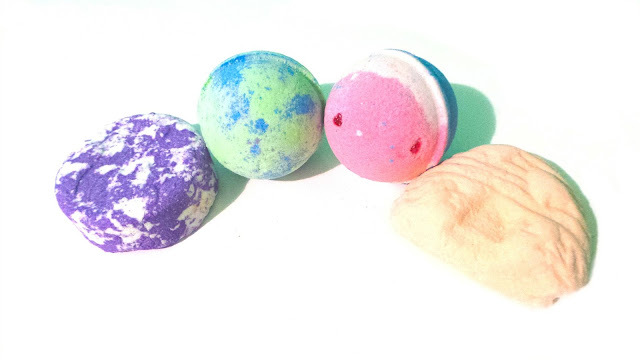 Oh, by the way - just wanted to mention that out of all of these, PlanetYum's Rock Pool Bath Bomb got the best applause from my nose's sniff test! The website describes the scent as "ocean spa fragrances", but it reminds me of watermelon - is there something wrong with my sense of smell? Regardless, I can't wait to use it - in fact, I may have to chuck it in the bath as soon as I post this and relax for a while! 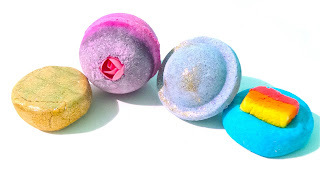 So although I'm still on the lookout for cheaper (yet still adorable) bath bombs and bubble bars, I'm super happy to have discovered this website - I'll definitely be placing an order with them again! Keep your eyes peeled, as I have some more blog posts coming up showing you what else I ordered from PlanetYum! P.S Where do YOU buy bath bombs and bubble bars? !